So back to Instructional Design…I’m not understanding why the teacher is eliminated from the equation. I understand that there are situations that demand a self-paced, individualized learning environment. However, successful life-long learners seek out experts, colleagues and mentors. This is the feedback loop in the Systems model. I love the “Granny-cloud” in the research done by Sugata Mitra. His research shows that children will naturally learn (Hole-in-the-Wall Education). The “granny-cloud” is added in and the children get to practice their English accent, show off their work, be encouraged, pointed in better directions, made to answer questions about their work. In other words they get feedback. Feedback can be “programmed” in to any type of learning instrument. My school currently uses Moodle and between creating questions and setting up the quiz there are 4-5 different types of feedback that can be made available to the students within Moodle. But the real feedback comes from a person analyzing and adjusting the upcoming coursework based on the performance of the students. A teacher’s compliment in a forum encouraging students in the right direction. Feedback must be real if the system is going to effectively maintain itself and grow. I suppose the root is I just don’t understand how an Instructional Designer does not see himself as a teacher. Update: For more thoughts and explorations on Teaching vs. Instructional Design see the Teaching vs. Instructional Design Category. Filed under Other, Systems, Teaching vs. Instructional Design Tagged with ID, Instructional Design, Systems, teachers, Teaching, vs.
One of the readings this week is some advice from Dave Cormier in Cluster and Focus -> Surviving Week 4 of a MOOC. The advice of cluster and focus is wise and timely. I have been feeling a overwhelmed at all the information. So many paths to take, so many exciting conversations, which way do I go? which way should I go. So I am taking a moment to re-evaluate my own goals in joining PLENK2010. I wanted to connect with other like-minded professionals and learn from others. I have wanted to learn more about PLE/PLN and Open Learning and this was a perfect opportunity to learn and experience these two ideas. During the first week’s discussion of PLE/PLN several thoughts and ideas came crashing together with the phrase Personal Learning Ecology. I have been focusing, at least my thoughts in this directions since week one. I feel like I side-stepped week two, am trying to play catch up for week 3 and am thankful for Dave’s post about looking for a focus. I still need to create my “mindmap”, but I have yet to find the right tool to create what I have pictured in my mind. I also feel like my PLE (I use this term in the sense of Personal Learning Ecology) is a work in progress, perhaps even still in that primordial goo, trying to figure out how to connect all the atoms into a coherent whole. So to add to my first two goals, I now want to explore, extend, expand upon this idea of Personal Learning Ecology. I like the living, breathing, changing nature of it. I like the idea of a system – its speaks order, purpose and potential to me. I like the personal nature, it is mine. It does not need to look or act like yours. Learning is central. I honestly do not know how not to learn. I have moments when information comes to my mind and I can’t recall how I know that little known obscure tidbit, but I do. There are days I come home and just want to shut out all the “inputs” – no light, no sound and yet my mind continues to work, searching for connections from the day until some other “input” demands my attention or grabs my curiosity. I am going to add this – “Do more about Personal Learning Ecology” to my list, hopefully there are others who will want to “cluster”. In another presentation that I attended via elluminate on Monday from The Future of Education Foundation Elevating the Education Reform Dialog, I was brought again to that age old question “What is learning?” So many things rest on how one defines this action. So I add to my list – “Create my definition of learning”. This is the central word in my PLE, so I think I should be able to define it for me. Connect with other like-minded professionals and learn from others. There are seven functions that are characteristic of all living systems. The Resource Base Function Every system must have a resource base which provides the necessary raw materials for that system. The Unity Function Every system must have an integrative force which unifies the system. The Maintenance Function Every system must maintain itself in order to insure the continuity of the system. The Feedback Function All complex systems must have information feedback to enable them to utilize the information for the purpose of effective system maintenance and growth. The Energy Function Energy Flow, external to the system, powers all complex systems. Resource Base – Carrying capacity/ Sustainability: Defines the limits within which the system will survive. Unity – Interdependence: Defines the mode of relationship that exists between the parts of a system best illustrated in the niche-community relationship. Duality – Cooperation/Competition/Partnership: Defines the mode of survival for living systems. 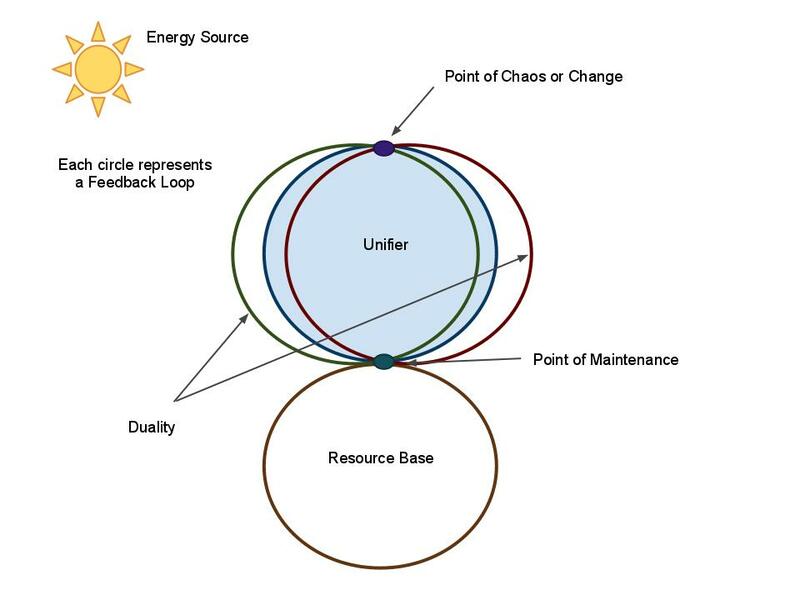 Feedback – Cycle: Defines the feedback loops that are fundamental to all systems. Energy – Energy Flow: Describes the entropic nature of all systems. In explaining these concepts he shared the following diagram (created digitally using GoogleDocs Draw). Systems Model diagram from Edward T. Clark, Jr.
As a science teacher I used the model to introduce the rock cycle (resource base), the water cycle (unifier), the air cycle (1/2 of duality), and the food cycle (the other 1/2 of duality); keeping in line with the ecological context. While this model was presented in the context of ecology it can adapt well to other types of systems. One of the keys I have found with applying this model in other contexts is to define what/who is the “Unifier”. For example, a high school with the principal as the unifier will have a different feel than another where the students are the unifier. Or using government, a unifier of a president would be different than if the unifier were the judicial branch. My next step is to look at these concepts and see how they apply to my PLE/PLN.